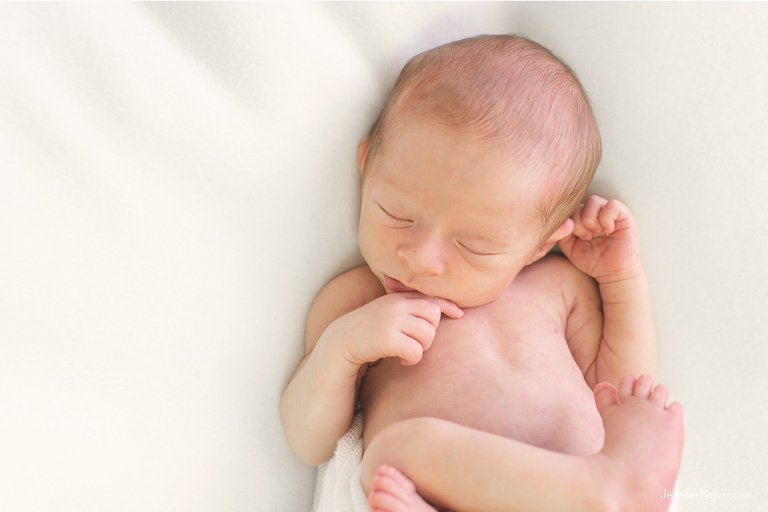 A tiny baby boy visited us in the studio this summer for a 10-day-old newborn photography session. We had the pleasure of photographing his parents’ maternity portraits several weeks ago, so by the time he arrived, we were anxious to meet him. As many babies do, this little one stayed very much awake and alert for much of his session. Right at the very end though, we were able to snap several sweet portraits on a simple white blanket, which is our favorite place to start with most sessions. The simple, neutral, clean white setting says everything about the freshness of a new baby. 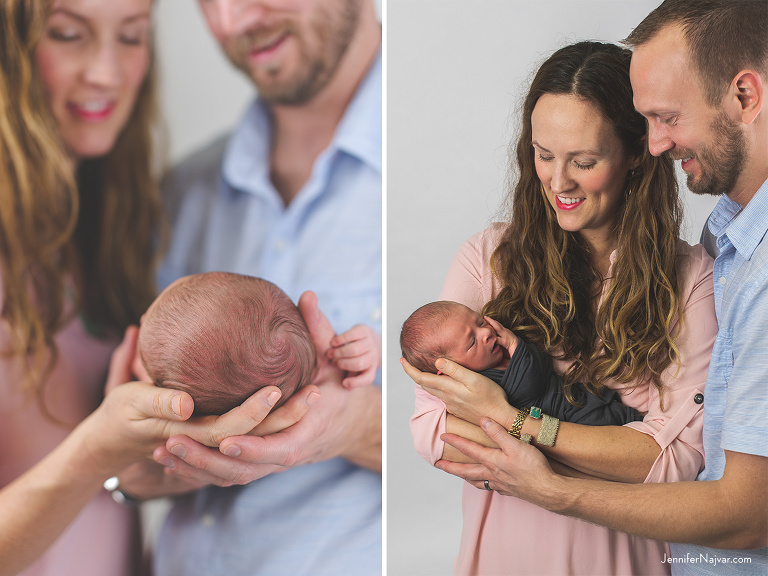 Newborn portrait shoots are not just about the baby — we place a big focus on photographing a variety of images at every studio newborn session with the family and individual portraits of parents and siblings. However, in every newborn photography session, we also try very hard to capture as many of the details as possible. Their tiny little fingers and toes, belly buttons, ears, eyelashes, and even the tops of their heads are all worthy of photographing. The way they move their hands, the yawns, the way they squish their faces, the way they twist and curl — we think these detail shots are so special for parents to look back on as their child grows up, and coupled with the family portraits, they help us tell a more complete story of every newborn. 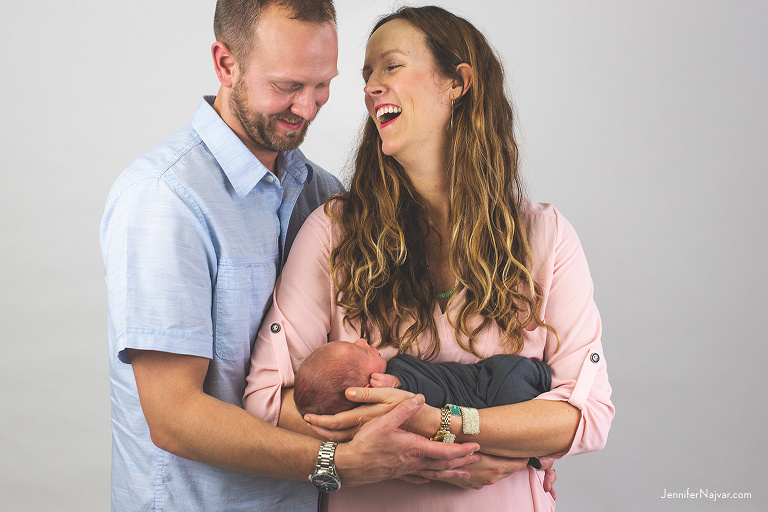 Parents will always remember if their newborn was born with a full head of hair or no hair at all, so we want to make sure we capture that knowing it’s something that they’ll look back on when they remember those early days of parenthood. In this 10-day-old newborn photography session, the adorable cowlick on the top of his head was one of those sweet, unique details, and the image that highlights it is one of our absolute favorites. Jennifer Najvar Photography specializes in Sunset Maternity photography in the Austin hill country and natural newborn portraits in the studio. Newborn sessions take place within the first 14 days after your baby’s arrival, so we recommend scheduling before you reach 30 weeks to ensure availability. If you’re interested in reserving your newborn or hill country sunset maternity session in Austin, Texas, contact us to start planning. We would love to chat with you about your session.